Pastorino A., Ramirez R.J., Agostini N., Dell'Omo G., Panuccio M.
Weather is one of the main factors affecting the migratory behaviour of birds. Rain and fog negatively influence bird flight, forcing animals to make long detours or to stop, waiting for better conditions, leading also in extreme cases to mortality events. We moni tored spring and autumn bird migration on the continental side of the Strait of Messina, which is the main bottleneck along the Central Mediterranean flyway, in particular for soaring birds. Fieldwork integrated visual observations and radar monitoring. The radar station was located on a mountain highland close to the seacoast, where fog and rain often occurred. During autumn 2016 a flock of White Storks detected by the observers disappeared into an extended fog bank. We could track with the radar the movement of the birds into the fog and the analysis of the trajectories revealed an extremely circuitous flight until the birds stopped. The radar also detected the departure, with birds trying to find a way out of the fog bank. 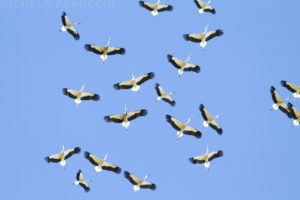 We compared track measurements of this flock with storks tracked during good vis ibility conditions. Ground-speed and straightness of the tracks showed a marked difference highlighting how fog deeply influenced their flight behaviour.